This page is under very much construction. Contributions are welcome via email to Jeff Miller. This page was last revised on Oct. 20, 2012. On Oct. 5, 1922, the "Gulf High School Notes" column in the New Port Richey Press reported, "We have no equipment at present but we hope that some plan will be devised in the near future for securing basketball outfits, as we wish to organize two teams, one for girls and one for boys. However, apparently no basketball was played during the 1922-23 school year. On Nov. 9, 1923, the New Port Richey Press printed an item from Gulf High Life: "The basketballs have arrived but the standards have not been put up yet, but we hope to have them up before long. We are also anxious to have the court hard-surfaced. The girls who are going in for basketball this season have been practicing almost every day. We are going to have practice periods every Wednesday. The boys' and girls' athletic association are planning a program, which is to be given next month, for the purpose of raising sufficient funds to hard-surface the basketball court. On Oct. 17, 1924, Gulf Hi-Life reported: "The girls are practicing very hard for a Junior and Senior Basket Ball Team, and some good games are expected soon." On Nov. 21, 1924, Gulf Hi-Life reports: "The Basket Ball girls have surely been practicing hard this week for the first team. We'll have ’some team' yet. Keep it up girls. The Team will be selected Friday. The girls will be in suspense until then. The manager received a letter from Brooksville asking for a game. Of course we will accept. Come on out 'rooters' and boost the team along. Your support is needed." The 1926 team was the "first winning girls basketball team" and captured the district title, according to the recollection of Eva Stevenson, who said the team "whipped everybody around." On Sept. 3, 1926, the New Port Richey Press reported that Betty Bailey and Ione Hill were manager and captain of the team. On Jan. 7, 1927, an item titled "Gulf High Notes" in the New Port Richey Press said there would be a basketball game against Dade City Friday night, both boys and girls teams. On Mar. 16, 1928, the New Port Richey Press reported: "The boy’s and girl’s teams journeyed to Brooksville Friday afternoon to play Basket Ball. We girls lost 14-12. The boys won 41 to 6. So ended the Basketball season." On Dec. 13, 1929, the Gulf girls team defeated Zephyrhills 24-11 at home. Gulf’s leading scorer was Ruth Draft. The coach of the Gulf girls team was Coach Shendell, athletic officer of the Paradise Post. The first inter-scholastic basket ball matches were played on the remodelled open-air court of the Gulf High school Friday night between that school and Brooksville. A large crowd witnessed the games. The girls’ game was lost to Brooksville, 14 to 16. The high point scorer of both teams was Miss Ruth Draft, Gulf High, with 12 points, the next being Miss Burns, Brooksville, with 10. The Gulf High boys won, 14 to 9. Hatton and Kolb were the star cagers, almost equalled by Good and Cook, Brooksville. After the games refreshments were served the players and substitutes at the school and then all repaired to the Knights of Pythias hall, where a dance was given in honor of the visitors by the girls of the Gulf High, the music being furnished by the recently formed high school orchestra. Last week, at Brandon, the Gulf High boys won, 19 to 1, and the girls, 17 to 1. The next match will be played at New Port Richey, girls and boys both, with Zephyrhills high school. The girls’ basketball team of Gulf high school is claiming the championship of Pasco and Hernando counties, after defeating Dade City, 53 to 13, in the final game of the season. Members of the New Port Richey team are seen above (left to right): Captain Grace Clark, Gwendolyn Pierce, Ruth Draft, Mary Anderson, Ina Anderson, Ina Littell, Selma Wester, Madelyn Littell, Evelyn Stevenson, Dolly Preister, Ella Meeth, Erika Preister, and Mrs. Rachel Kirkman, coach. Ruth Draft is the team’s high scorer. It is believed that this was the 1929-30 team. On Jan. 16, 1931, the Tarpon Springs Leader reported that the boys and girls basketball teams from Gulf would be playing the boys and girls teams from Tarpon Springs High School tonight in Tarpon Springs. On Feb. 16, 1934, Gulf High School News (a section of the New Port Richey Press) reported: "Friday night the local girls were defeated by the Brooksville girls with a score of 15-7. 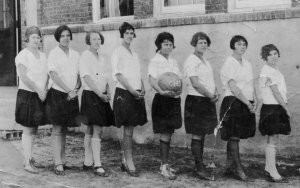 Gulf high girls who participated in the game were: Nita Witt, Barbara Mitchell, Clara Herms, Rose Frierson, Juanita Black, Rosie Lee Zuber, Margaret Thiel and Ahna Casey." On Feb. 21, 1936, the New Port Richey Press reported that the team defeated Zephyrhills 17-12, in a double-header in which the boys teams from both schools also played. A picture of the 1936 team shows Coach Williams and Miss Lewis and players Ruth Chevis, Clara Willis, Marion Barck, Margaret Thiel, Bertha Frierson, Eva Anderson, Elora Zuber, Rosalie Zuber, Margaret Hodges, Helen Suhonen, Pauline Chevis, Edna Sheldon. On Oct. 9, 1936, the New Port Richey Press reported, "The Girls basketball team met on Thursday of last week and elected Miss Katherine Kelly as manager for the season. Thirty-four girls have expressed a willingness to join the organization. The meeting brought out the fact that athletic equipment is needed, and that dues should be paid immediately. The first basketball practice was held Tuesday afternoon, under the direction of Miss Sarah Katherine Lewis, coach." On Feb. 18, 1938, the New Port Richey Press reported that the team lost to Dade City 15-1. The team consisted of Ruth Stone, Alice Mae Schotoe, Helen Colgon Hope, Gene Weiskopf Madden, Thelma Teague, Angie Jackson Hatcher, Hazel Stevenson Uzzle, Mildred Falany King, Kathryn Bragg. Coach: Marguerite Marchman. The 1947 yearbook shows Coach A. H. Stevens and team members Mary Elizabeth Frierson, Louise Nichols, Lucy Jones, Doris Connor, Lucille Nichols, Grayce Hurst, Ollie May Fortner, Mozell Smith, Vernice Heinkel, Marylyn Smith, Mamie Jean Harper, Carol Baillie, Betty Sawyer. A Jan. 26, 1951, newspaper article reported that the team lost to Brooksville 42-36. The 1953 yearbook shows coach Pat Tingue and team members Bobbie Potter, Beth Stevens, Arline Beers, Marlyn Gamble, Arlene Freckman, Roberta Sawyer, Shirley Casper, Carolyn Clark, Sylvia Hudson, Jean Hodges, Gail Cassen, Judy Minton, Kay Sue DeCubellis. Coach: Mrs. Jane Morris. Players: Judy Minton, Edna O'Dell, Christine Heinkel, Eleanor Hatcher, Barbara Hatcher, Gail Casson, Kay Sue DeCubellis, Marlyn Gamble, Beth Stevens, Carolyn Clark, Bobbie Potter, Loretta Gamble, Arlene Freckman, Emma Lou Neiderriter, Jo Ann Hodges. Home games were in Sims Park, preceding the boys games. The team defeated Crystal River 47-44, with Marlyn Gamble scoring 27 points. The team lost to Zephyrhills 45-43, with Marlyn Gamble scoring 30 points. On Dec. 16, 2004, the team defeated Tarpon Springs 104-16, possibly establishing a new school record for girls basketball up to that date. On Feb. 17, 2005, the team defeated Crystal River 59-48 to advance to the tournament semifinal game. The win brought the team record this year to 25-1. On Feb. 22, Gulf lost the region 3 semi-final to Winter Haven, 68-29. The record for the year was 25-2, under head coach Mike Quarto. On Nov. 18, 2005, the team defeated Zephyrhills, 101-14. On Feb. 18, 2006, the team ended its season with a 29-2 record, losing to Bishop Moore Catholic High School 45-33 in the Class 4A Region 2 final. The 29-2 record is believed to be the best in school history, and it was the school’s first region final game. Players included Dominique English, Tiara Cook, Santana Lennon, and Turquoise Sampson. At the end of the season, the team was tied for second in the state in Class 4A rankings. In the 2004-05 and 2005-06 seasons combined, the team compiled a 54-4 record and did not lose to a county opponent. Head coach: Mike Quarto. The team had a regular season record of 21-4 and was undefeated at home. Head coach: Mike Quarto. Head coach: Mike Quarto. Players include: Nicole Adams, Kianna Mills, Lani Paselio, and Asia Spencer. On Dec. 11, 2009, the team defeated Anclote 100-2, apparently establishing a record for the greatest margin of victory. Anclote was a new high school with an inexperienced team with no seniors. On Feb. 5, 2010. Gulf defeated Hudson 63-13 to win the 4A-7 district semifinal. On Feb. 11, Gulf defeated Wiregrass Ranch to win the regional quarterfinal. On Feb. 16, Gulf lost to Wesley Chapel in the regional semifinal game, 29-27. Head coach: Mike Quarto. On Nov. 18, Gulf defeated Hudson 86-6. Players included Nicole Adams, Hannah Kotzen, Lexy Schulman, Cait Corbitt, and Leighlani Paselio. Gulf went 12-0 in district games, winning by an average margin of 47 points. Nicole Adams scored her 2000th career point near the beginning of a game vs Wesley Chapel on Jan. 14, 2011. Play was stopped briefly and Nicole was honored by Coach Quarto. Head coach: Mike Quarto. On Nov. 29, 2011, Gulf defeated Hudson 73-13. On Dec. 14, Gulf defeated Fivay 70-19. On Feb. 14, 2012, the team won the regional semifinal game, defeating Pasco 64-47. On Feb. 18, the team lost the regional final to Bartram Trail, 56-39. Team record: 28-3, under head coach Mike Quarto. Players included Kadejah Saunders, Kayla Kivinski, and Lexy Schulman. This article appeared in the St. Petersburg Times on March 23, 1994. Mr. Robison died on April 18, 1994. His basketball team was 1-23 and had no real chance of winning in the first round of the district tournament. So no one could have blamed Ron Robison for skipping the game. He was seriously ill.
Robison would have none of that. "I said, `Ron, the game compared to your life is nothing,' " said Gulf High principal Cheryl Renneckar. "He begged me - `Please let me coach one more game.' "
Renneckar said yes and Gulf lost. But that didn't matter to Robison. It is the game, and the youngsters who play it, that has meant everything to the 59-year-old coach. And he wasn't going to miss that last one. "Ron was ill and he had been hiding it from himself," Renneckar said. "His speech was slurred and he was snapping at his players, and that is very unlike him. He has always been the most patient, gentle coach. We knew something was wrong, but he wouldn't go to the doctor." But after that last district game, Robison went for an exam. And what he and his wife, Shirley, and all those close to him had feared was true. Robison again has cancer, and this time it is said to be terminal. He is expected to live only a few months. "I met with his cross-country team and the girls basketball team to let them know how sick he was," Renneckar said. "I said, `Coach Robison is not going to get better.' There were a lot of tears." In a lifetime of coaching, Robison has shaped the lives of countless high school athletes. Renneckar hopes some of them can now be there for their old coach. "Ron has touched so many lives and has meant so much to Gulf High," Renneckar said. "He is sick now and he needs to hear from those folks he coached. They need to know now that he is seriously ill."
Robison has left school and is at home with his wife. He was too ill to talk this week. Mrs. Robison spoke briefly. "He knows the situation and he’s dealing with it well," Mrs. Robison said. "It’s very difficult. I just keep encouraging him to try and get well." Renneckar said the Robisons are hoping for a miracle, much like when cancer and a series of strokes struck Robison in 1984 and he recovered. Robison had a cancerous kidney removed, which forced him to step down as Gulf’s boys basketball coach. Robison started therapy and began to recover. He eventually returned to coach cross country, junior varsity softball and girls soccer. In 1991, he returned to his first love, basketball, when he was named Gulf’s girls coach. "My wife was a little hesitant," Robison said at the time, referring to his fragile health. "But we made the decision we'd try it out. I certainly hope I'm not putting myself at risk; it never even crossed my mind. To me it’s worth it." Winning, of course, is not what made coaching so worthwhile to Robison. It is the opportunity to work with teenagers and share his knowledge of things that go far beyond the court. "Ron is just a very dedicated person and he dedicated his whole life to the kids," Shirley Robison said. Added Renneckar: "Ron is one of those real quality people who works with kids in a positive, upbeat manner. Even when his team was 1-24 this season and didn't really have much talent, Ron always emphasized the positive things." Robison is a small man: 5 feet 2 and 128 pounds. But he is "a small man with a big heart," Shirley Robison said. The Robisons have four children ages 26 to 40. They came to Pasco County in 1974 from Greenwood, Ind., where Robison started coaching 35 years ago. Gulf High will recognize Robison by naming a new sportsmanship award after him. It will be presented to an athlete each spring. "Sportsmanship is what Ron Robison represents," Renneckar said. "Win or lose, he always shook your hand. He did the right thing." While Robison’s girls endured a difficult season this year, past teams have enjoyed extraordinary success. 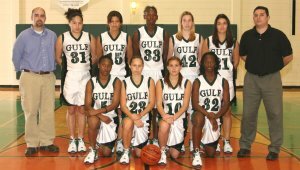 In 1991-92,his first year back coaching girls basketball, Gulf went 16-5. And in 92-93, the Bucs were 17-8. At Hudson High, Robison went 98-15 in five seasons and won four consecutive Gulf Coast Conference titles. His career mark in girls basketball is 132-53. Robison also had solid cross-country teams at Gulf, and in 1991 he coached the girls soccer team to 9-0-1 mark and the GCC title. One of the many students Robison influenced is Dawn Uekerus, now the girls basketball coach at River Ridge High. Uekerus played for Robison from 1976 to 1980 at Hudson, when the Cobras had four consecutive 20- win seasons. "He’s the reason I am where I'm at," said Uekerus, whose River Ridge team won the Sunshine Athletic Conference title this season. "He was my biggest influence to become a PE teacher and a coach. He has been a big inspiration in my life. It’s a sad thing that he is sick, and I really wish there was something I could do. But there really isn't." Uekerus has been by to visit Robison and so has current Gulf boys basketball coach Greg Bollinger. Robison hired Bollinger straight out of college in 1982 to be his assistant boys coach at Gulf. "It’s hard to put into words what he has meant to me," Bollinger said. "He’s the one who gave an opportunity to a gung-ho kid fresh out of college who thought he knew it all and learned he really didn't know anything. "He taught me that the kids come first and basketball comes second. He taught me to respect the kids. He bent over backward for them and they loved him so much. They knew he was always there for them." This article appeared in the Tampa Tribune on Feb. 15, 2006. OCALA - In its 30th game of the season, second-ranked Gulf finally received a challenge from an in-state foe, and watched its defense rise to it convincingly. Leading by only five after three periods, the Bucs (29-1) held No. 8 Ocala West Port (25-4) to one fourth-quarter field goal to pull away for a 54-37 triumph in the Class 4A-Region 2 semifinals Tuesday night. The Bucs, who still haven't allowed a Florida team to come within 16 points of defeating them, play at Orlando Bishop Moore (26-3) in Saturday’s region championship. A win sends Gulf to its first state tournament, set for next week at The Lakeland Center. For a change, the Bucs encountered a bumpy stretch Tuesday on that road to Polk County. West Port closed the third period with a 13-4 run to cut Gulf’s lead to 37-32. Keishana Roberts' missed breakaway layup at the third-quarter horn was all that prevented the Wolf Pack from trailing by only a possession entering the final quarter. But Gulf went on a 8-0 run to start the fourth, and made seven of eight free throws down the stretch to seal things. Gulf converted only five field goals in the second half but sank 17 free throws during that time, finishing 27-for-34 from the stripe. "We wanted to see what the competition would be like as we got farther up," said Bucs senior center Tiara Cook, who led all scorers with 18 points. "So we needed somebody to give us pressure, somebody to have an intensity level equal to or above ours, so it was good." West Port center Hannah Jones, a 6-foot-1 junior who spent the night banging with Cook on the inside, led her team with 14 points. Freshman Gabriel Austin, West Port’s top perimeter threat, picked up her fourth foul 15 seconds into the second half and scored only six. This article appeared in the St. Petersburg Times on Feb. 15, 2006. Gulf emerged from its dressing room and found a hallway flooded with fans. The Buccaneers were greeted with a roaring ovation. Players smiled and danced through the crowd making their way to the charter bus home. Well-wishers couldn't resist slowing them with hugs and high-fives. Everyone, it seemed, wanted to touch Gulf after its historic 57-34 Class 4A victory Tuesday at Ocala West Port. The win lifts Gulf to the region final for the first time, its game at Orlando Bishop Moore billed to be the biggest in school history. Gulf (29-1) came here looking for a formidable challenge to build confidence in its journey toward the final four. The Wolf Pack (25-4) provided a sound test. "We needed it really bad," Gulf senior Tiara Cook said. "We wanted to see what the competition would be like as we went up the chart. We needed somebody to give us pressure, somebody to have an intensity level equal or above ours. It was perfect. " The Wolf Pack starters had size, speed and the talent to match Gulf. Hannah Jones, standing at 6-foot-1, proved she could battle the lankier Cook, who admitted Jones was her toughest challenge of the season. "I need to get in the weight room," Cook said. "She is good." Gulf trailed just once all game and reclaimed the lead for good at 6-5 with 3:31 left in the first quarter on a Santana Lennon basket. The Bucs were led by Cook’s game-high 18 points and Santana Lennon’s 12. Dominique English scored 14 in a homecoming of sorts. Many of Gulf’s fans were here to support the Ocala native, including her mother, Monique. The Wolf Pack looked lost without 3-point specialist Gabriel Austin. She sat most of the game with foul trouble. That allowed the Bucs to focus on interior defense. They smothered West Port with pressure, forced tons of turnovers and turned them into plenty of fastbreak opportunities for a 27-15 halftime lead. West Port managed a comeback late in the third quarter to cut the Bucs' lead to 37-32. But Gulf put it away in the fourth, outscoring West Port 17-5. "We knew they were going to make a run at us," Gulf coach Mike Quarto said. "You hold a team that’s ranked eighth in the state to 37 points in the game, that’s a hell of a job defensively."